Cockroaches are primitive insects whose origin extends back at least 300 million years and are thought to have originated in the tropical and sub-tropical areas of Africa. The advent of travel and international trade has brought about the spread of cockroaches to most countries in the world. Although worldwide, there are over 3,000 species of cockroaches, only half a dozen have attained the status of pest species by adapting themselves to cohabit with man in his dwelling. The remaining non-pest species inhabit decaying plant material, dark damp areas such as caves, and beneath the bark of rotting trees. The omnivorous appetite of cockroaches makes any unprotected foodstuffs susceptible to cockroach infestation and contamination. Their indiscriminate feeding sources in such areas as sewers, drains and garbage areas bring them in contact with disease organisms including salmonella and other organisms associated with dysentery, typhoid, hepatitis and tuberculosis. Cockroaches are nocturnal creatures and are seldom seen in any quantity during daylight hours, however, in areas where there are heavy infestations, sightings of cockroaches may become more common. 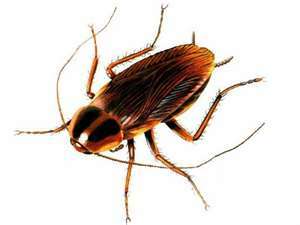 It is generally accepted that for every cockroach seen there are at least a further ten that are hidden away in out of sight harbourages. Common harbourage areas include cracks and crevices,, dishwashers, electrical motors and switches, ovens and almost any warm, moist areas where food is available. Tell tale signs indicating cockroach activity include the presence of egg cases, regurgitation marks, faecal pellets, odour and cast-off nymphal skins. 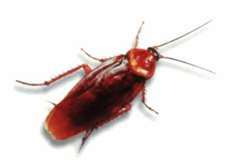 Infestation occurs when cockroaches are carried into premises on raw materials or packaging or gain entry to the premises through drain covers, ventilation openings and under doors. Most common species have wings, but have a tendency to crawl rather than fly. When disturbed, cockroaches have the ability to scurry away with remarkable haste. surface prior to the eggs hatching. The young cockroaches, or nymphs as they are referred to, emerge from the egg case and over a period of up to a year, go through 5-12 moults as they increase in size. They achieve adulthood after the final moult and are capable of breeding 2-3 weeks later. They areprolific breeders with the most common of the pest species, the German cockroach, being capable of producing 20,000 offspring within a twelve month period. Female cockroaches also have the ability to produce young without mating. This is referred to as parthenogenesis. Successful cockroach control is based on Integrated Pest Management (IPM) starting with a thorough inspection of the entire premises to identify the species and to define the extent and source of infestation. Observations made during the inspection enable a program to be proposed which considers all possible facets of control procedures including proofing, trapping, sanitation, hygiene and the judicious use of preparations. 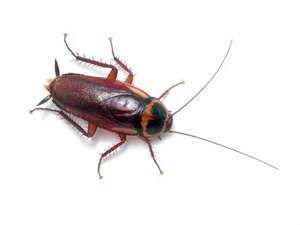 Recent preparations developed for cockroach control are of low mammalian toxicity and do not persist in the environment. A new group of preparations called insect growth regulators are being presently used by the industry. These compounds prevent the immature stage of the insect from achieving adulthood and so prevent propagation of the species. The advantage of such formulations is that they are usually specific to a particular pest and have little effect against non-target species.